Antique Red Smooth Leather Seat with Silver Rivets. Manufactured and Made in The USA. This seat is covered with Antique Red top grain cow hide Leather with Stainless Steel Rivets. 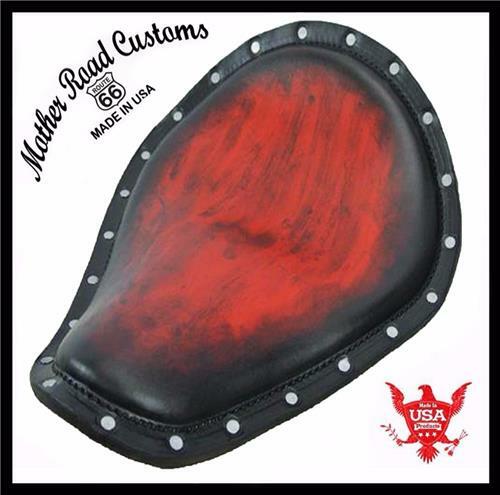 The bottom of the seat is also covered with USA Made veg tanned tooling leather. The mounting hardware is not includedin the buy it now price. The hardware kit can be found in my store for purchase. The pan measures 11" wide by 14" long. The studs in the rear are spaced 7" apart. You can call 314-972-4305 to ask questions, orto make a payment over the phone. As always, thanks for shopping at Mother Road Customs!